A gift for the truly special person or persons in your life. Designed especially for the Sarabeth breakfast aficionado. 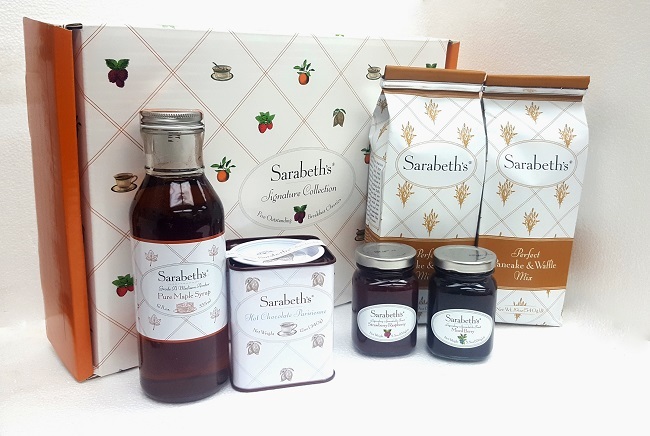 Contains 2 Sarabeth's Pancake Mixes, 12oz Hot Chocolate Parisienne, two 5.5 oz. jams and Maple Syrup. Select any 2 flavors for the 5.5 oz jams from a list of our most popular: Peach Apricot, Mixed Berry, Strawberry Rhubarb, Strawberry Raspberry, Pineapple Mango, Blood Orange Marmalade, Strawberry Peach, Plum Cherry, Orange Apricot Marmalade.